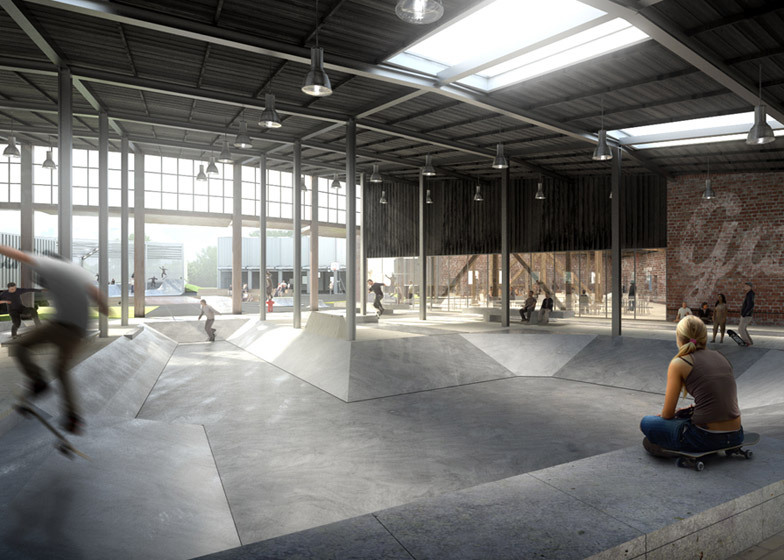 News: Danish architecture studio EFFEKT has triumphed in a competition to design a street sports facility in and around a crumbling train engine roundhouse in Esbjerg, south-west Denmark (+ slideshow). 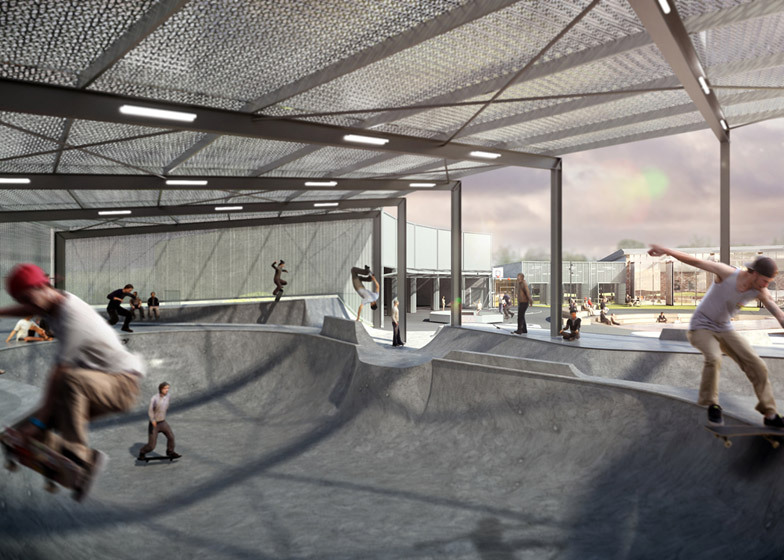 EFFEKT will transform the former locomotive maintenance shed, arranged around a circular turntable, with a new youth and community centre centred around skateboarding – one of Europe's fastest-growing sports. 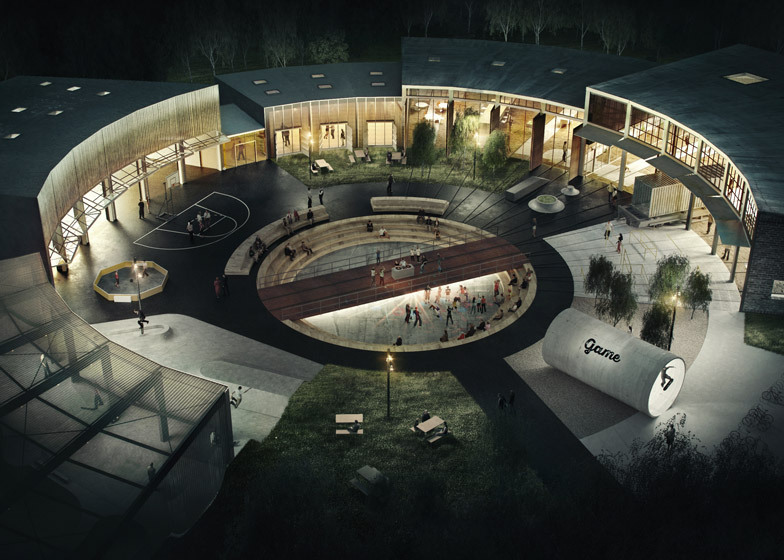 Named Streetmekka Esbjerg, it is one of three facilities proposed in Denmark by non-profit organisation Realdania, which plans to take advantage of the decline of industry in cities by transforming abandoned warehouses into street culture hubs. The vision is to make urban sports and activities more inclusive and accessible all year round, even in the Scandinavian climate. The architects point out that many of these disused buildings have already been taken over "by skaters, street artists and the like". "The existing setting and atmosphere fit so intuitively with the programmatic brief," said architect Tue Foged, one of the two founders of the Copenhagen studio. "Placing a playground for street culture that celebrates community and creativity on one of the most important historic sites in Esbjerg is also a way to preserve and reinterpret the historic relevance," he said. An assortment of indoor and outdoor spaces will be arranged around the sunken hollow originally designed to hold the turntable. 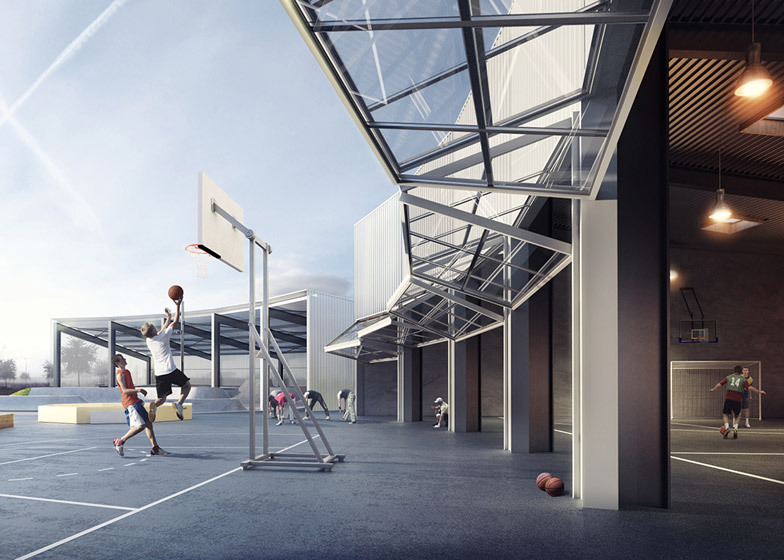 These will include a sheltered space for transition and bowl skating, indoor and outdoor basketball courts, a street dance area, an indoor skate arena, workshops for DJing and street art, and a cafe and kitchen. "The brief was equally exiting and ambiguous; is it even possible to create a framework for the unorganised sports that thrive with spontaneous participation and fluctuating schedules? And can we do so without compromising the cultural heritage of the existing industrial setting?" asked Foged, whose past projects include a cancer care centre. "We believe that with this project we prove that we can," he said. 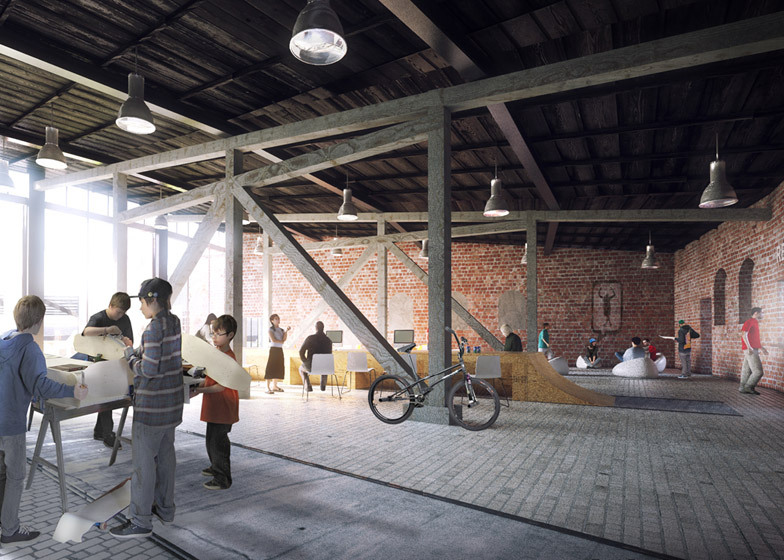 "Rather than taking the tabula rasa approach deleting history we chose to recycle and reinterpret the circular typology of the train engine depot and turn it into a hybrid of industrial heritage and social activity space." 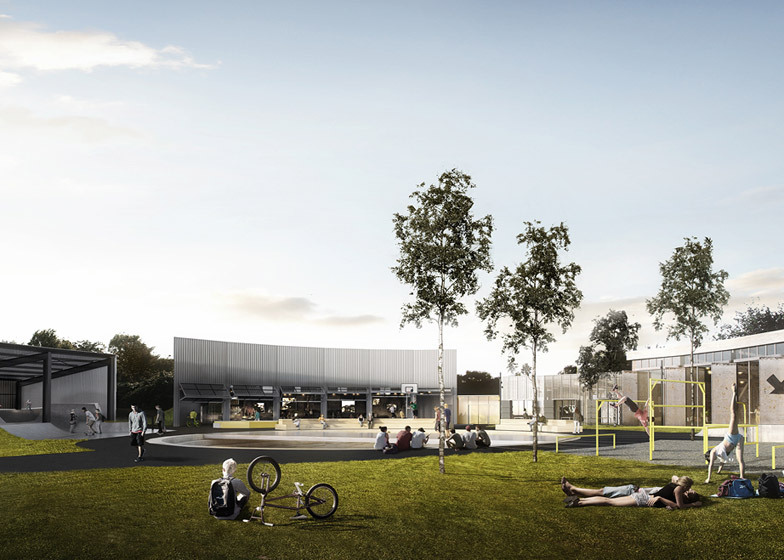 Streetmekka Esbjerg is expected to open in winter 2015. 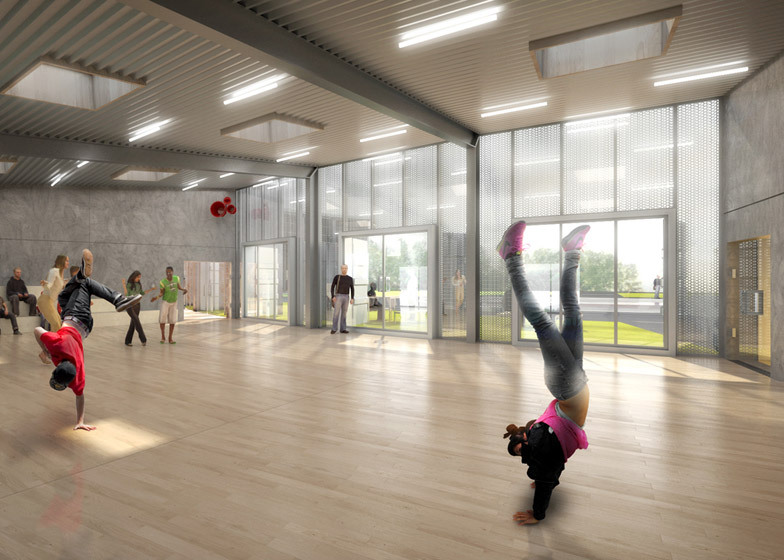 Other facilities will include offices, changing rooms, a social space and a reception.